There are few things that make a submissive as beautiful as a proper collar! This is a collar of our own brand. It´s sensual and beautiful in genuine leather with lockable buckle. 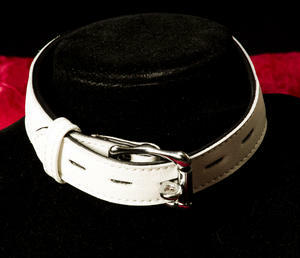 The collar is adjustable and the buckle can be both unlocked and locked. When it is locked it´s locked at the neck with a padlock. There is also a O-ring in front of the collar that is perfect for a leash, a more symbolic padlock and so on. 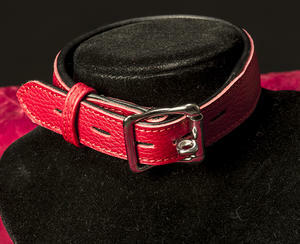 To be extra soft and comfortable to wear this collar is has a padded but still slim lining.